Soap Hope and Hugo Naturals, both leaders in the all-natural body care industry, form a strategic partnership to expand distribution of Hugo Naturals' line of products through Soap Hope's multi-channel distribution network. Soap Hope of Dallas, Texas, and Hugo Naturals of Chatsworth, California, two of the leading businesses in the all-natural body care industry, have formed a strategic, long-term partnership to expand distribution of Hugo Naturals' line of products through Soap Hope's multi-channel distribution network. Soap Hope's product offering has been strengthened and deepened with the addition of a wide variety of Hugo Naturals' products. Hugo Naturals benefits from Soap Hope's extensive market reach through Soap Hope's online retail stores, social networking programs, and relationships with community groups focused on women's issues. Hugo Naturals is a leading manufacturer of all-natural, high-quality and affordable body care products. Soap Hope is a leading online distributor of all-natural body care brands. Customers may now buy Hugo Naturals products at SoapHope.com. "Hugo Naturals is pleased to have a developing retail partnership with SoapHope.com," says David Greenbaum, vice president of sales for Hugo Naturals. "Our companies share common values about responsibility and sustainability. Consumers are actively seeking out companies like ours. They prefer to buy products from companies that take their social responsibilities seriously." The companies' new strategic partnership leverages each other's unique capabilities and characteristics: Soap Hope's extensive community reach and Hugo Naturals' reputation as one of the most trusted manufacturers of all-natural products. Soap Hope has seen dramatic growth since its founding in December 2008 through unique marketing programs that focus on three priorities: women's issues, environmental sustainability and all-natural living. Hugo Naturals is a leading voice for sustainable and healthy living and has a committed customer following. The partnership is fresh but both companies have already seen its benefits. "After announcing the partnership between Hugo Naturals and Soap Hope, we received a strong and positive response from both our customers and our distribution partners. We're including information about Hugo Naturals in every communication to our customers, and the response has been outstanding," says Craig Tiritilli, co-founder of Soap Hope. Soap Hope recently attained national attention by announcing in April, 2009 that it will each year invest 100 percent of annual profits for a rolling period of one year into microlending funds for women entrepreneurs around the world. In addition, Soap Hope is launching initiatives with local and national women's groups. Soap Hope's product line is bolstered by the addition of Hugo Naturals soaps and other reputable products. Founder Hugo Saavedra gained national recognition for his aptitude with all-natural and exotic ingredients through Sanfer Farms, which supplied ingredients to celebrity chefs. Later, Saavedra expanded his business to include all-natural body care products with the Hugo Naturals line. "The new partnership between Soap Hope and Hugo Naturals is an instinctive fit," says Tiritilli. Both companies share key values and business practices such as providing high-quality products, maintaining focus on the customer, improving health and quality of life through the use of botanical ingredients and open communication with customers regarding ingredients and business practices. Each company also places a premium on education about its products and business practices. Saavedra maintains a blog, Hugo's Natural Blog, discussing the importance and benefits of all-natural ingredients in body care products. Soap Hope's blog, the Soap Hope Learning Center, contains articles to help consumers learn about body care products, ingredients, choices and the company's micro lending practices. Founded by Hugo Saavedra in 2006 and based in Chatsworth, C.A., Hugo Naturals creates all-natural hand-crafted body care products. The product line includes bar soap, shampoos and conditioners, lotions, shower gels, balms and candles. By using only the best ingredients, Hugo Naturals maintains its reputation as a luxury yet affordable product line. For more information about Hugo Naturals, contact David Greenbaum at 206-396-6896. Texas businessmen Salah Boukadoum and Craig Tiritilli founded Soap Hope in 2008 after the sale of their technology company. Located in Dallas, TX the company promotes environmentally friendly business practices and invests 100 percent of its profits into micro-lending funds for women entrepreneurs. The company is best known for carrying high-quality, handcrafted products to its online customers. 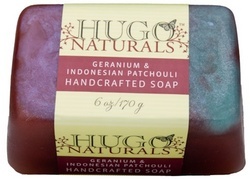 For information and to buy Hugo Naturals products visit SoapHope.com. For more information about Soap Hope, contact Salah Boukadoum at 888-893-7627.